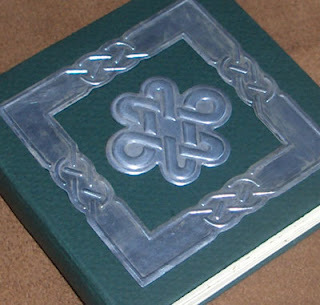 This celtic gem arrived for the book swap from Meredeth, known on Etsy as yatsu. Meredeth was inspired to harken back to her Anglophile days by a pack of metal decorations she nearly tripped over in the "Hot Spot" sale department of her local Archiver's paper store. 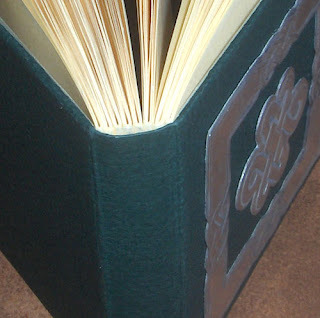 Her happenstance meeting with cardstock of a color mysteriously termed "hemlock" completed the moment and thus a compact little hardcover book was conceived. Several hours of finger-puncturing, pants-gluing, table-scarring labor later, the book you see before you was birthed. Meredeth's memory of the event has since been suppressed in the interest of protecting what little sanity remains to her, but she tells us that that the book is approximatey 4 inches square, that the covers are most likely illustration board covered in the aforementioned hemlock-toned cardstock, and that the pages are either mild white sketch paper or ivory computer paper. No further comment has been received on that subject. She does know that the recipient was pleased to get it and is, with any luck, scribbling happy scribbles on the pages even as you read this. Visit Yatsu.Etsy.com if you would like to see more work by Meredeth. it's so prettiful! 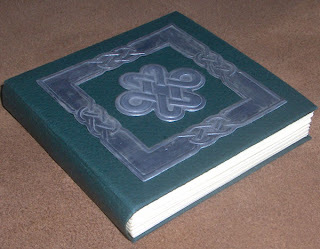 the green looks perfect with the celtic design!